PonderWonders: Recipe of the Week: Tilapia, Tomato, And Zucchini Foil Pouches! 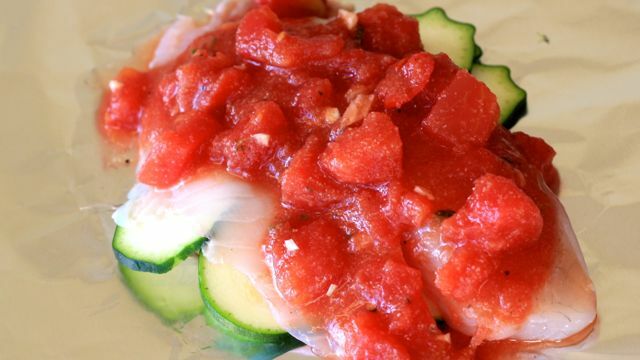 Recipe of the Week: Tilapia, Tomato, And Zucchini Foil Pouches! Now, don't get me wrong, there is nothing wrong with eating what you like. It's just that for me, I realize now, it was not a healthy choice because I was feeding my feelings instead of dealing with them. Yep, in case you did not know it, I am human too! And I refuse to beat myself over it. I did it and now I am taking accountability for it, doing something about it for me and nobody else but me! Hmmm...that reminded me of a song, but I won't derail. Needless to say, things are starting to settle in for me. I have a new job, new friends and a new home. I'm starting to feel in my zone again and I want to feel healthy again. For me it's not about just losing the extra pounds I've gained, its really about feeling healthy again. I really do not like how I am feeling. I already deal with hypertension and I really do not want to make it easy to those other ailments that come with age growing up growing wiser (yea I like that one better). So, I am on a "getting healthier" mission. Therefore, you will find more and more healthier recipe choices with a few perks here and there. This weeks recipe of the week is Tilapia, Tomato, And Zucchini Foil Pouches. I got the recipe from one of my favorite chefs Dani Spies of Clean and Delicious. Its simple, nutritious and delicious! Tear off 4-big squares of foil. The foil should be a few inches longer than the fillet. Combine the garlic, tomatoes, thyme and some salt and pepper in a small bowl. Place about 6-8 sliced of zucchini rounds on each piece of foil and lay the fish on top. Top each fillet with ¼ of the tomato mixture. Pull up sided of foil and seal shut. Be sure the foil is sealed or your fish will not cook. Place on a baking sheet and bake for 15 to 20 minutes. Serve over some quinoa or brown rice and enjoy!! Please do come back and share how your Tilapia dish turned out! I'd really love to hear about it! Mmm anything with tomato will definitely tantalise my tastebuds! Do you think someone who has very little or no experience in the kitchen (like myself, haha) would be able to make this? Good luck with your get healthy mission! This really does sound yummy! I am a HUGE non-seafood eater. There's only a wee small amount of seafood I'll eat, and even than it's not set in stone. Like, I love popcorn shrimp but if I get some that's too fishy... Can't eat. However! Tilapia is one I've liked before. I need mine totally breaded. ;P But I may have to try this. I adore zucchini.